Incendiary weapons, as the term is understood in international humanitarian law (IHL) describes weapons that act mainly through fire and heat. Napalm and white phosphorous are probably the best known incendiary substances used in incendiary weapons. 1980 Protocol on Prohibitions or Restrictions on the Use of Incendiary Weapons (Protocol III to the CCW) prohibits the aerial delivery, in relation to the conduct of hostilities during armed conflict, of incendiary weapons within a concentration of civilians. Under the Protocol, a 'concentration of civilians' means 'any concentration of civilians, be it permanent or temporary, such as in inhabited parts of cities, or inhabited towns or villages, or as in camps or columns of refugees or evacuees, or groups of nomads.' Art. 1(2). any weapon or munition which is primarily designed to set fire to objects or to cause burn injury to persons through the action of flame, heat, or combination thereof, produced by a chemical reaction of a substance delivered on the target.Art. 1(1). The definition’s scope is limited by the requirement that the weapon or munition must be ‘primarily designed’ to act through flame and/or heat, but it is broad in that it includes weapons from flame throwers, shells, rockets, and grenades, to mines, bombs and ‘other containers of incendiary substances’. Excluded from the definition and, hence, from the scope of the Protocol are munitions which have ‘incidental incendiary effects’ (such as illuminants, obscurants or tracers), and combined effects munitions ‘in which the incendiary effect is not specifically designed to cause burn injury to persons’. Because munitions containing incendiary substances can be used for incendiary and for other purposes (for example to create smoke), the Protocol’s definition of an incendiary weapon has in recent years been subject to debate. In this regard, the Final Declaration adopted by the Fourth Review Conference of the CCW (2011) noted concerns raised by some High Contracting Parties ‘about the offensive use of white phosphorous against civilians’ and further ‘that there was no agreement on various aspects of this matter.’CCW, Final Document of the Fourth Review Conference, Geneva, 14–25 November 2011, UN doc. CCW/CONF.IV/4/Add.1. For more information, see the entry on white phosphorus munitions. Incendiary weapons that take the form of cluster munitions falling within the scope of the 2008 Convention on Cluster Munitions (CCM) are prohibited under that Convention. Excluded from the definition of a cluster munitions are munitions or submunitions designed to dispense flares, smoke, pyrotechnics or chaff.CCM, Arts. 2(2) and 2(3). Under the CCM, submunitions that contain an incendiary substance, and which are dispersed or released by a cluster munition and are designed to function by detonating an explosive charge prior to, on or after impact, are prohibited. A commentary to the CCM points out that the border line can be blurred between the use of an incendiary substance, such as white phosphorus, to create smoke and its use as an incendiary weapon. See, G. Nystuen and S. Maslen (Eds. ), The Convention on Cluster Munitions – A Commentary, OUP, 2010, §2.116. Certain incendiary substances used in incendiary weapons, like white phosphorous, also pose harm to humans through their toxicity. Such ‘toxic chemicals’, as well as ‘munitions and devices’ containing toxic incendiary substances can be ‘chemical weapons’ prohibited under the 1992 Chemical Weapons Convention (CWC).‘Toxic Chemical’ under the CWC means ‘Any chemical which through its chemical action on life processes can cause death, temporary incapacitation or permanent harm to humans or animals. This includes all such chemicals, regardless of their origin or of their method of production, and regardless of whether they are produced in facilities, in munitions or elsewhere. (Art. 2) Toxic chemicals are chemical weapons prohibited by the Convention, except where intended for purposes not prohibited under the Convention, including if they are used for military purposes not connected with the use of chemical weapons and not dependent on the use of the toxic properties of chemicals as a method of warfare; or if they are used for law enforcement including domestic riot control purposes. (Arts. 1(a) and 9(c) and (d). Emphasis added.) ‘Munitions and devices’ containing toxic incendiary substances are chemical weapons prohibited under the Convention when they are specifically designed to cause death or other harm through their toxic properties, which would be released as a result of the employment of such munitions and devices.(Art. 1(b)) For a discussion of the relationship between incendiary toxic chemicals, or munitions and devices containing toxic incendiary substances, and chemical weapons, see D. Fidler, 'The Use of White Phosphorus Munitions by U.S. Military Forces in Iraq', ASIL Insights, 2005; SIPRI, Incendiary Weapons, 1975, 187-226. In view of the toxic and asphyxiating effects of many incendiaries, the 1925 Geneva Gas Protocol for the Prohibition of the Use in War of Asphyxiating, Poisonous or Other Gases, and Bacteriological Methods of Warfare also requires consideration.Report of the UN Secretary-General, Napalm and other Incendiary Weapons and all Aspects of their Possible Use, 1973, §192. Massive use of incendiary weapons can also have long-term ecological consequences, which can be severe and are largely unpredictable. The massive use by the U.S. of incendiary weapons in Vietnam was one of the catalyst for the promulgation of the 1976 United Nations Convention on the Prohibition of Military or Any Other Hostile Use of Environmental Modification Techniques (ENMOD).E. F. J. Yuzon, 'Deliberate Environmental Modification Through the Use of Chemical and Biological Weapons: "Greening" the International Laws of Armed Conflict to Establish an Environmentally Protective Regime', 11(5)(1996) American University Law Review, 804. Use of incendiary weapons in the conduct of hostilities, including weapons with incendiary effects that fall outside of the scope of CCW Protocol III, is governed by the general rules of international humanitarian law, particularly the prohibition on the use of means or methods of combat that are of a nature to cause superfluous injury or unnecessary suffering, and rules relating to the protection of civilians from the effects of hostilities, including the prohibition on indiscriminate attack. the anti-personnel use of incendiary weapons (i.e. against combatants) is prohibited, unless it is not feasible to use a less harmful weapon to render a person hors de combat.ICRC, 2005 Customary IHL Study, 2005, Rule 85. Already the 1868 Saint Petersburg Declaration reflects concern at the injuries and suffering caused by certain projectiles ‘charged with … inflammable substances’ used against persons. However, the use of ‘incendiary projectiles’ against aircraft is not prohibited under the 1922 Hague Rules on Air Warfare (never adopted in legally binding form). Although customary IHL does not provide absolute protection to combatants from the use of incendiary weapons, in the opinion of the ICRC, it requires states to assess whether a less harmful weapon can be used, and that incendiary weapons, including flame throwers, should not be used against persons, or only under certain conditions, such as when they are under armoured protection or in field fortifications.See, 'Phosphorous weapons- the ICRC's view', Interview with P. Herby, 17 January 2009; ICRC, Customary IHL Study, 2005, Practice in relation to Rule 85.
if incendiary weapons are used, particular care must be taken to avoid, and in any event to minimize, incidental loss of civilian life, injury to civilians and damage to civilian objects. The ICRC, thus, did not conclude that the detailed rules in Article 2(2) to 2(4) of CCW Protocol III, including the prohibition on launching air-delivered incendiary weapons into concentrations of civilians are customary international humanitarian law.ICRC, Customary IHL Study, Rule 84. Any use of incendiary weapons in the course of hostilities must, however, comply with the IHL prohibition on indiscriminate attacks, in particular the prohibition on attacks which employ a method or means of combat which cannot be directed at a specific military objective, or the effects of which cannot be limited as required under IHL, as well as the specific prohibition on area bombardment, the prohibition on disproportionate attacks, and the requirement to take all feasible precautions in the choice of means and methods of attack with a view to avoiding, and in any event to minimizing, incidental harm to civilians.Additional Protocol I, Arts. 51(4)(b) and (c); 51(5); and 57(2)(a)(ii). Incendiary weapons have been cited in practice as being indiscriminate in certain or all contexts.ICRC, Customary IHL Study, Practice relating to Rule 71. The use of methods or means of warfare that are intended, or may be expected, to cause widespread, long-term and severe damage to the natural environment is prohibited. Destruction of the natural environment may not be used as a weapon.ICRC, Customary IHL Study, Rule 45. A range of rights protected under international human rights law are put at risk by the use of incendiary weapons, including the right to life. A number of judicial or quasi-judicial bodies have dealt with injury, death or damage from heat or fire. In many instances, it is unclear, however, whether these cases concern use of an incendiary weapon as defined under international law, of other weapons with incendiary effects, or more generally, of fire as a weapon (arson). In the case of Juan Carlos Abella v. Argentina ('La Tablada' case) the petitioners alleged that the Argentine military had used ‘White phosphorus or incendiary bombs’ in its operation to retake the barracks at La Tablada, and that by its use of ‘incendiary weapons’, the Argentine military had violated the prohibition on the use, in armed conflict, of weapons of a nature to cause superfluous injury or unnecessary suffering. The Commission noted that ‘even if it were proved that the Argentine military had used such weapons, it cannot be said that their use in January 1989 violated an explicit prohibition applicable to the conduct of internal armed conflicts at that time’, as Argentina had ratified CCW Protocol III only in 1995, and because the temporal scope of the CCW was limited to international armed conflict, and did, hence, not directly apply to the internal hostilities at La Tablada. The Commission also noted that ‘the Protocol does not make the use of such weapons per se unlawful. Although it prohibits their direct use against peaceable civilians, it does not ban their deployment against lawful military targets, which include civilians who directly participate in combat.’ Owing to lack of sufficient evidence that state agents had used illegal methods and means of combat, the Commission concluded that the killing or wounding of the attackers which had occurred prior to the cessation of combat did not constitute violations of the American Convention or applicable humanitarian law rules.Case No. 11.137, Report No. 55/97, Inter-Am. C.H.R., OEA/Ser.L/V/II.95 Doc. 7 rev. at 271 (1997), §§9, 10, 180, and 187– 8. In the case of case of Ayubov v. Russia, the applicant complained about the destruction of his property, a house and two cars, by armed men in camouflage uniforms using a flame-thrower. The Court, found that the alleged perpetrators were State agents, that no justification had been provided for the agents’ actions, and that there had been a violation of the applicant’s property rights under Article 1 of Protocol No. 1 (guaranteeing the peaceful enjoyment of ones possessions).ECtHR, Ayubov v. Russia, Judgment (Merits and Just Satisfaction), 12 February 2009, §§11, 101–5. A Draft Convention submitted by the United Kingdom to the League of Nations Disarmament Conference in 1933 included a prohibition of the use of incendiary weapons. It applied to the ‘use of projectiles specifically intended to cause fires’ (with some qualifications), as well as to ‘the use of appliances designed to attack persons by fire’.League of Nations doc. Conf. D. 157 (Corrigendum), Art. 49. See also, 1936 Preliminary Report of the Work of the Conference, stating that ‘the use of chemical, incendiary, or bacteriological weapons against any State or in any war whatever its character, is prohibited’, while reserving the right of reprisal. League of Nations doc. Conf. D. 171 (i), 111. The 1938 Amsterdam Draft Convention for the Protection of Civilian Populations Against New Engines of War (never adopted in legally binding form) prohibits the use of ‘chemical, incendiary or bacterial weapons’ in times of war. The instrument defines incendiary weapons as ‘projectiles specifically intended to cause fires except when used for defence against aircraft’ but exempts from the prohibition a number of devices.1938 Amsterdam Draft Convention for the Protection of Civilian Populations Against New Engines of War, Arts. 6 and 8. The prohibition shall not apply: I. to projectiles specially constructed to give light or to be luminous; II. to pyrotechnics not normally likely to cause fires; III.to projectiles of all kinds which, though capable of producing incendiary effects accidentally, are not normally likely to produce such effects; IV. to incendiary projectiles designed specifically for defense against aircraft when used exclusively for that purpose; V. to appliances, such as flame-projectors, used to attack individual combatants by fire. Resolution XXIII, Human Rights in Armed Conflicts, adopted by the International Conference on Human Rights held in Teheran on 12 May 1968: ‘ …the use of chemical and biological means of warfare, including napalm bombing, erode human rights and engender counter-brutality ’. Report of the UN Secretary-General, Napalm and other Incendiary Weapons and all Aspects of their Possible Use, 1973: '...in view of the facts presented in the report, the group of consultant experts wishes to bring to the attention of the General Assembly the necessity of working out measures for the prohibition of the use, production, development and stockpiling of napalm and other incendiary weapons. 'UN doc. A/8803/Rev. 1, 1973. Sub-Commission on Prevention of Discrimination and Protection of Minorities Resolution 1996/16, International peace and security as an essential condition for the enjoyment of human rights, above all the right to life: ‘… the need to curb the production and the spread of weapons of mass destruction or with indiscriminate effect, in particular … fuel-air bombs, napalm, …’See also, Report by the Secretary-General submitted pursuant to Sub-Commission resolution 1996/16, UN doc. E/CN.4/Sub.2/1997/27 of 24 June 1997. See also UN doc. E/CN.4/SUB.2/RES/1997/36 (1997) and Human rights and weapons of mass destruction, or with indiscriminate effect, or of a nature to cause superfluous injury or unnecessary suffering, Working paper submitted by Y.K.J. Yeung Sik Yuen in accordance with Sub-Commission resolution 2001/36, UN doc. E/CN.4/Sub.2/2002/38 of 27 June 2002, updated in E/CN.4/Sub.2/2003/35 of 2 June 2003. Pursuant to the UN Secretary-General's Bulletin on the Observance by United Nations forces of international humanitarian law, the use of incendiary weapons is prohibited.UN doc. ST/SGB/1999/13 of 6 August 1999, paragraph 6.2. In a decision of 9 July 2013, the Israeli Supreme Court, sitting as the High Court of Justice, denied a petition for order nisi brought by Yoav Hess and others v. Chief of Staff (Case no. HCJ 4146/11) concerning the use, by the Israeli Defence Forces (IDF), of white phosphorus in populated areas. For more detail on this case, see the separate entry on white phosphorus munitions. The use of fire as a weapon has a long history, and early incendiary weapons, like incendiary arrows, early firebombs and flamethrowers, dominated the battlefield for centuries until the introduction of gunpowder in the 15th century. The German army added flamethrowers to its arsenal in the 1914–18 War and by the end of the 1930s, hand-held and vehicle-mounted flamethrowers were in widespread military use on all sides. During the inter-war period, incendiary weapons were used by Italy in Ethiopia, as well as in the Spanish civil war and the Sino-Japanese war. The Geneva Disarmament Conference of 1932-1933 gave considerable attention to the question of incendiary weapons. The Draft Disarmament Convention presented at the end of the conference (never adopted in legally binding form) would have explicitly forbidden the use of projectiles specifically intended to cause fire, and appliances designed to attack persons by fire.For more detail, see, SIPRI, The Law of War and Dubious Weapons, 1976. The 1939–45 War saw large-scale use of air-delivered incendiary weapons in population centres. In 1944, the Soviet Air Force dropped tons of incendiary bombs on Helsinki, and the Allied forces dropped the first napalm bombs on Tinian Island. Several tens of thousands of tons of bombs, mostly incendiary bombs, were subsequently dropped on cities and towns in Japan, causing immense devastation and massive loss of live. 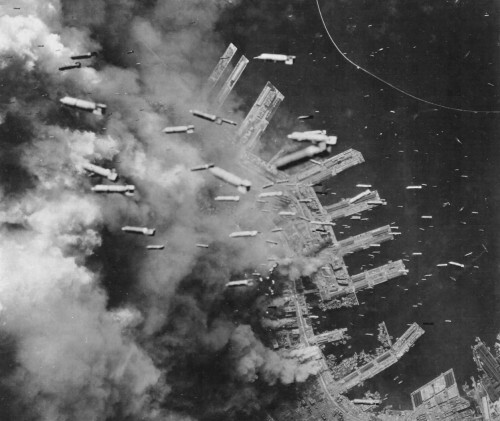 The bombing of Tokyo with incendiary weapons incinerated more people than the nuclear bombing of Hiroshima. German populations also suffered heavily from the use of incendiary weapons. The air raids on Hamburg (1943) and Dresden (1945) resulted in huge firestorms that consumed large parts of these cities.For more information, see, e.g., SIPRI, Incendiary Weapons, 1975, 30-40. During the Cold War period, incendiary weapons were widely used in Algeria, Cambodia, Indo-China, Korea, the Sinai, Vietnam and elsewhere.See, e.g. SIPRI, Incendiary Weapons, 1975, 40-69; Human Rights Watch, Memorandum to Convention on Conventional Weapons Delegates: The Human Suffering Caused by Incendiary Munitions, March 2011. Pulitzer Prize winning photograph of Phan Thi Kim Phuc taken by Associated Press photographer Nick Ut (1972), following the bombing of the Vietnamese village Trang Bang has become emblematic of the extreme suffering and terrible impact on civilians caused by incendiary weapons. During the 1970s, there was growing interest in addressing harm from the use of certain conventional weapons, most notably napalm and other incendiary weapons. Several initiatives dealt with this issue. The first suggestion within the United Nations that the use of napalm might be banned was contained in a report of the Secretary-General prepared in pursuance of a request by the General Assembly in its resolution 2444(XXIII). In 1972, the General Assembly adopted a resolution characterising incendiary weapons as ‘a category of arms viewed with horror’, and in 1973, the United Nations Secretary-General issued a detailed report on ‘Napalm and other Incendiary Weapons and all Aspects of their Possible Use’, which called for the prohibition of napalm and other incendiary weapons.UN General Assembly Resolution 2932 (XXVII) of 29 November 1972; Napalm and other Incendiary Weapons and all Aspects of their Possible Use: Report of the Secretary-General; UN doc. A/8803/Rev. 1, 1973. For a more detailed overview of diplomatic initiatives dealing with napalm and other incendiary weapons in the early 1970s, see Department of Political and Security Council Affairs, The United Nations and Disarmament 1970-1975, United Nations, New York, 1976, Chapter X.
by Krajina Serb forces in Bihać​, Bosnia and Herzegovina, (1994).UN doc. S/PRST/1994/69; U.N. Doc. E/CN.4/1995/89 (1995) 8 March 1995.
by Turkey in Iraq (1991).C. Hedges, 'Iraqis are Arming the Rebel Kurds in Turkey's South', The New York Times, 20 October 1991; R. Gurdilek, 'Turkish Attacks in Northern Iraq; Kurds Claim Civilian Villages Hit', AP News Archive, 26 October 1991.
by Russian forces in Chechnya (1999).P. Felgenhauer, 'Russian Strategy in the Chechnya Wars', Parameter bewaffneter Konflikte, 2000.
by the USA in Iraq (2003 and 2004). Although it was initially denied, the USA later admitted having used a napalm-like incendiary weapon during the Persian Gulf War in Iraq (2003).See, 'Fire Bombs in Iraq: Napalm By Any Other Name', Iraq Analysis Group, March 2005, updated April 2005. In 2004, US forces allegedly used artillery shells loaded with white phosphorous in Fallujah, Iraq, to target insurgents in so-called ‘shake and bake’ fire missions.See, 'US: Incendiary weapon used in Iraq', Al Jazeera, 16 November 2005; D. Hambling, 'U.S. Denies Incendiary Weapon Use in Afghanistan', Wired: Danger Room, 15 May 2009.
by the USA and the Taliban in Afghanistan. According to media reports, the USA deployed an incendiary weapon to Afghanistan.See, D. Hambling, 'U.S. Denies Incendiary Weapon Use in Afghanistan', Wired: Danger Room, 15 May 2009. There are unconfirmed allegations that the USA also used incendiary weapons in Afghanistan. See, Human Rights Watch, White phosphorous: the New Napalm?, 8 June 2011.
by Ethiopian forces in Mogadishu, Somalia (2007).UN doc. S/2007/436, §§30–4. by Palestinian armed groups in Israel (2011).UN doc. S/2010/483 of 17 September 2010; Human Rights Watch, Memorandum to Convention on Conventional Weapons Delegates: The Human Suffering Caused by Incendiary Munitions, March 2011.
by Syrian armed forces in Syria (2012/2013). There have been allegations that Syrian armed forces air-dropped incendiary weapons, including incendiary cluster munitions and improvised ‘barrel bombs’, into concentrations of civilians.US State Department spokesperson Victoria Nuland affirmed that ‘the barrel bombs were “incendiary bombs which contain flammable material that can be like napalm' or can be packed with nails and launched from the air or from a launcher.’ ‘Syria army using missiles, barrel bombs’, News24, 13 December 2012. See, in particular, 'First Evidence Of Incendiary Submunition Cluster Bombs Used in Syria', Brown Moses Blog, 21 November 2012; Human Rights Watch, Syria: Incendiary Weapons Used in Populated Areas, 12 December 2012.
and by Russia in Syria (2016).M. Wareham, Dispatches: Incendiary Weapons Pose Civilian Threat in Syria, Human Rights Watch, 21 June 2016. Russian state-run television reportedly released video footage showing incendiary weapons, specifically, RBK-500 ZAB-2.5SM bombs, being loaded on a Su-34 fighter-ground attack aircraft. The use of incendiary weapons by Russia was confirmed by Russia’s Minister of Foreign Affairs, Sergey Lavrov, in a letter to Human Rights Watch. Lavrov attributed the ‘significant humanitarian damage’ caused by incendiary weapons in Syria to their ‘improper use’. Incendiary weapons can be portable or mechanized, and they can be used with different weapon platforms. They include such diverse weapons as flamethrowers, incendiary grenades, landmines and fougasses The term ‘fougasse’ describes a variety of devices that are usually buried in the ground, are set off from a distance and project debris or flame in the direction of an enemy. Flame fougasses can act like flame throwers or incendiary mines. See, for example, Intelligence Bulletin, vol. III, no. 3, 1944, p. 80., air-dropped unitary ‘firebombs’, incendiary cluster munitions, incendiary rockets, incendiary artillery or mortar shells, incendiary naval ordnance, as well as improvised incendiary devices, for example, ‘Molotov cocktails’. Over 180 models of incendiary weapons currently exist.HRW, Memorandum to Convention on Conventional Weapons Delegates: The Human Suffering Caused by Incendiary Munitions, March 2011, citing Jane’s Ammunition Handbook 2007-2008. For an overview of incendiary weapons used in World War I and World War II, see SIPRI, Incendiary Weapons, 1975, pp. 75-80. For a proposal on possible ways of classifying incendiary munitions with a view to legal regulation, see ICRC, Report, Conference of Government Experts on the Use of Certain Conventional Weapons (Lucerne, 24.9-18.10.1974), Geneva, 1975, p. 106. Magnesium is a common metal incendiary. It can produce very high burning temperatures. In contact with burning magnesium, water may produce an explosive mixture of hydrogen and other gases, which renders fire-fighting measures very complicated. When magnesium particles react with moisture in the human body it can lead to further tissue necrosis. Thermite, a mixture of powdered aluminium metal and ferric oxide, is a pyrotechnic incendiary. Thermite can produce temperatures of over 2000 degrees Celsius and can scatter small drops of molten metal, which may prolong and extend the incendiary effect, and can cause multiple deep burns. Napalm is perhaps the most notorious oil-based incendiary substance. Napalm was originally a mixture of napthenic and palmitic acids, developed at Harvard University in 1942-43. Napalm compositions had a higher viscosity than earlier oil-based incendiary substances. It could be spread further and burned more slowly but at a higher temperature. This increased the likelihood of secondary fires. Napalm is not self-igniting, and is hence often combined with phosphorous. Napalm was widely used in World War II in flamethrowers and air-dropped bombs. Subsequently, napalm was used as a generic term to refer to incendiary compositions developed later, although these actually contain different chemical components. So-called Incendergel, Napalm-B or NP2 for instance, consist of a mixture of benzene, gasoline and polystyrene. These compositions burned longer, at somewhat higher temperature, and could be spread over wider areas. Such incendiary compositions tend to stick even to vertical surfaces and are almost impossible to remove. White phosphorous is probably the most important pyrophoric incendiary. It ignites spontaneously in contact with atmospheric oxygen and continues to burn while exposed to oxygen until it is depleted or oxygen supply is cut off. The chemical reaction creates heat of around 815 degrees Celsius, as well as light and thick white smoke. This makes white phosphorous useful for creating smokescreens, illuminating areas, marking and signalling, providing tracers for ammunition, as well as for detonating mines, fuel supplies and ammunition caches. White phosphorous is not an effective incendiary substance for use against structures that are difficult to ignite, but it has been used against persons and to ignite oil-based incendiaries. Triethylaluminium (TEA) is also pyrophoric and, in addition, reacts violently with water. It can produce temperatures of up to 2300 degrees Celsius, but burns very rapidly, making it unsuitable for use against materiel. Thickened TEA compositions (TPA) are used in small incendiary rockets designed to replace flamethrowers. The thermal radiation is said to be akin to a ‘fireball’ and being capable of inflicting full thickness (third degree) burns to a person in a bunker even without direct contact with the substance.For more detailed descriptions, see, SIPRI, Incendiary Weapons, 1975. Mark-77 (Mk-77) type air-dropped unitary bombs are the primary incendiary bombs in active service in the US armed forces. Bombs of this type were reportedly used by the USA in Iraq and allegedly also in Afghanistan. These bombs are an evolution of the incendiary bombs M-47 and M-74, used during the Korea and Vietnam wars. In contrast to these older weapons, the filling of newer Mk-77 type bombs is composed of a polystyrene-like gel and kerosene-based jet fuel. The container is cigar-shaped and lightweight, made of aluminium. When the bomb is released from the aircraft, the container will tumble end over end, the arming wires are pulled from the fuzes, arming the bomb. When the bomb detonates, the container will rupture, disbursing the fuel gel mixture, which is then ignited. Incendiary cluster submunitions, for instance, the US M-69 or the Soviet ZAB-25 were developed early in the 1939–45 War and used in huge numbers by the USA in fire raids on Japanese cities.For more types of US incendiary submunitions, see A. Parsch, BAK to BSU/BSG - Equipment Listing; G. Goebel, Incendiary Bombs/ Runway Breakers / Electonic Attack Weapons. A more recent US incendiary submunition is the M74A1. An M35 cluster munition can disperse 57 such incendiary submunitions. Incendiary weapons of the Russian ZAB series have reportedly been used in Syria in 2012/2013. Among them the RBK-250 ZAB-2.5 bomb containing 48 ZAB-2.5 submunitions, the ZAB-100-105 and the ZAB-500 unitary bomb. The ZAB-100-105 may be found with a solid incendiary filling material or can be filled with small Incendiary bomblets which are scattered by the high-explosive bursting charge. N.R. Jenzen-Jones, 'ZAB-100-105 Incendiary Bomby in Syria', The Rogue Adventurer, 24 December 2012. 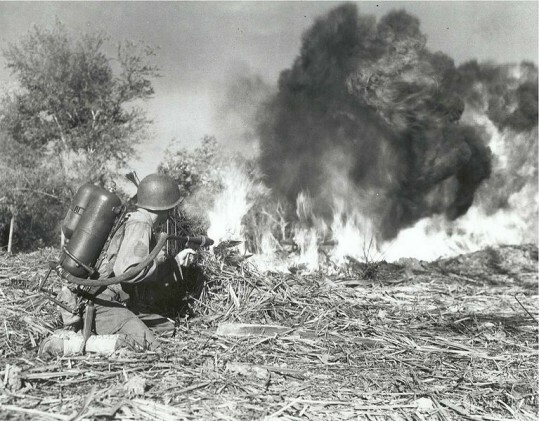 Flamethrowers, widely used in the first and second world war and in the Korea and Vietnam wars, have not been in the US arsenal since 1978. The US M202A1 ‘Flame Assault Shoulder Weapon’ (FLASH) was developed to replace flamethrowers, producing the same type of effects but with greater range and accuracy. It is a four-barreled bazooka firing M74 rockets equipped with M235 warheads, containing approximately 1.34 pounds (0.61 kg) of thickened pyrophoric agent (TPA), a liquid which spontaneously combusts in air and burns at high temperature. On impact a rocket scatters burning incendiary over a twenty-meter radius. Used for similar purposes, the Russian ‘Shmel’ is a single-shot, man-portable, shoulder-launched rocket weapon system intended for dismounted infantryman that can fire RPO-Z incendiary rounds, as well as a fuel-air explosive round (RPO-A) and a smoke round (RPO-D). The US AN-M14 incendiary hand grenade contains a thermate mixture that generates heat to 4000 degrees Fahrenheit. The grenade filler will burn from 30 to 45 seconds. The grenade body is of thin sheet metal and is cylindrical in shape. Incendiary weapons work through a powerful exothermic (heat-producing) reaction typically involving oxygen in the surrounding air (or an oxidizing agent) and some sort of incendiary substance such as magnesium, napalm, thermite, triethylaluminium or white phosphorous. The combustion process can produce and sustain very high temperatures. The intense heat can melt metal structures and degrade non-flammable materials. In addition, the heat ignites secondary fires in flammable materials, like wood, plastics or asphalt. The combustion process rapidly retrieves the oxygen from the surrounding air and replaces it with carbon monoxide (CO). Under certain conditions, fires can coalesce into a ‘massfire’ or ‘firestorm’ characterized by hurricane strong winds and extremely high temperatures. Incendiary weapons are effective against fortified positions, armoured vehicles and dug-in emplacements. As the incendiary component can penetrate within targets, they can be used to drive out enemy soldiers from defensive positions.They can also be used to burn down vegetation providing cover for enemy forces.‘The greatest advantage of the flamethrower is it ability to penetrate small openings and fill fortified positions with both fire and smoke. Thus, the enemy either burns or asphyxiates due to the lack of oxygen available to breath. In the urban environment, the flamethrower can shoot fire around corners to enhance movement past dead or blind angles.’ N.T. Perkkio, Bring on the Flamethrower, 8 February 2005. Incendiary bombs or shells are often described as area weapons, because they are ‘effective over a broad area, whether they are used against point targets or area targets’. The area effect may be due to the dispersal of the incendiary substance over an area or the self-propagating character of secondary fires.ICRC, Weapons that may Cause Unnecessary Suffering or have Indiscriminate Effects, Report on the Work of Experts, 1972, §§199 and 222; See also §56. Incendiary weapons cause severe injury, including through thermal and chemical burns, pulmonary damage due to the inhalation of smoke and toxic fumes, circulatory shock, heat stroke, asphyxiation, and carbon monoxide poisoning. These effects are often fatal. Victims who survive suffer intense pain, severe infections, organ failure, and have lower resistance to disease. Injuries can result in lifelong deformity and disability, and often psychological trauma. Severe burn injuries are extremely painful and require immediate, specialized and intensive medical care. The severity of the burn wounds depends on the depth of the burn (the degree) and the extent of the body surface area affected. Metal incendiaries burn at very high temperatures and have a tendency to splatter small particles of molten or burning metal onto the victims. This can cause multiple small but deep burns. Tissue destruction may be increased by the reaction of the incendiary, e.g. magnesium, with moisture in the body. Napalm-type incendiaries stick to and burn hot on the human body for an extended time (10-15 minutes), leading to extensive burns prone to infection. Even partial thickness (second degree) burns from napalm on a relatively small percentage of the skin can cause shock.Report of the Secretary-General, ‘Napalm and Other Incendiary Weapons and all Aspects of Their Possible Use’, UN doc. A/8803/Rev. 1, 1973; SIPRI, Incendiary Weapons, 1975, 152. Certain incendiary substances are toxic. Failure to remove them from the body may have fatal consequences. White phosphorous, for instance, is highly soluble in fat, and thus in human flesh. If white phosphorus enters the bloodstream it can cause multiple organ failure. For this reason, burns on only 10% of the body are often fatal.Human Rights Watch, 'Memorandum to Convention on Conventional Weapons Delegates: The Human Suffering Caused by Incendiary Munitions', March 2011; SIPRI, Incendiary Weapons, 1975, 198 and Appendix 4A. The burning of the incendiary substance and secondary fire consume oxygen from the surrounding air and emit large quantities of carbon monoxide. As a consequence, people in the vicinity may suffer respiratory injury from the inhalation of noxious gases. They may lose consciousness and can die from heatstroke, pulmonary burns and carbon monoxide poisoning, or from asphyxiation. The effects of heat and carbon monoxide poisoning are particularly important causes of mortality in large-scale fires resulting from incendiary attacks. The treatment of burn victims is difficult, prolonged and intensely painful, at times involving multiple surgeries. The resources necessary to effectively treat severe burn injury are rare in many countries and likely to be inaccessible in times of armed conflict. Burns sustained in times of war are associated with high early mortality, but in many cases death may not ensue for days or even weeks of great suffering.SIPRI, Incendiary Weapons, 1975, 135-6. Certain incendiary substances, like white phosphorous, cannot easily be extinguished and present particular problems of treatment. White phosphorous particles projected by an explosive weapon can penetrate deep into soft tissue. Within the human body, it can burn for hours and tends to cause small, deep lesions. Victims and medical professionals who try to remove it may inadvertently spread the burning material to other areas of the body, in particular the hands. Wounds that have been cleaned and dressed can reignite again when dressings are removed. White phosphorous wounds are very slow to heal. When incendiary weapons are used in conjunction with explosive weapons, victims may suffer combined burn and blast injury, which are associated with higher mortality than each wounding type alone. Mortality from incendiary weapons will also be affected by the state of health and nutrition of the affected population, and the limited resources to treat burn injuries. Certain incendiary substances, like white phosphorous, can continue to burn in contact with oxygen for several days after their dispersal, and thereby pose a continuing health risk.Human Rights Watch, Rain of Fire, 2009, documents cases of civilians who were inured from stepping on white phosphorus remains up to 12 days after major hostilities had ended. Survivors can suffer long-term respiratory problems from the effects of carbon monoxide poisoning. Severe burn wounds usually result in disability even after the wound has healed. Victims may experience loss of motor function due to the damage to muscles and scarring. Scars and other alterations of the physical appearance, the trauma from the severe injury and the painful and prolonged treatment, often involving isolation, can have serious psychological effects in the long-term, and can lead to withdrawal from society. The incendiary weapon itself and fires ignited by it can cause massive devastation to private property and public infrastructure. The spread of fire is difficult to predict and contain. Large-scale fires are difficult to fight. Under certain conditions large-scale fires can coalesce into a firestorm, associated with extremely high temperatures and hurricane strong winds, which is beyond the capacity of fire-fighters to control. A firestorm consumes all combustible matter within the affected area. People within this area, even those in underground shelters, are highly likely to die, either from the extreme heat or by asphyxiation.US air-raids with incendiary weapons on Japanese population centers killed 260,000 people and injured another 412,000. Nearly two and a quarter million homes were destroyed and 9.2 million people left homeless. ICRC, Weapons that may Cause Unnecessary Suffering or have Indiscriminate Effects, Report on the Work of Experts, 1972, §206. Extensive destruction of homes, productive assets, food stocks, and public infrastructure following use of incendiary weapons can have wide-spread and long-lasting impacts on the well-being and survival of populations beyond those directly affected. Recent studies suggest that soot and ash lofted into the atmosphere as a result of large-scale fires and firestorms could impact regional weather and the climate.See, for example, O. B. Toon et al., 'Atmospheric effects and societal consequences of regional scale nuclear conﬂicts and acts of individual nuclear terrorism', in Atmos. Chem. Phys., 7, 1973–2002, 2007, 1989-99. Incendiary bombs are dropped by U.S. Army Air Forces on Kobe, Japan, 4 June, 1945. U.S. soldier of the 33rd Infantry Division using a flamethrower. Source: 33rd Infantry Division Association.